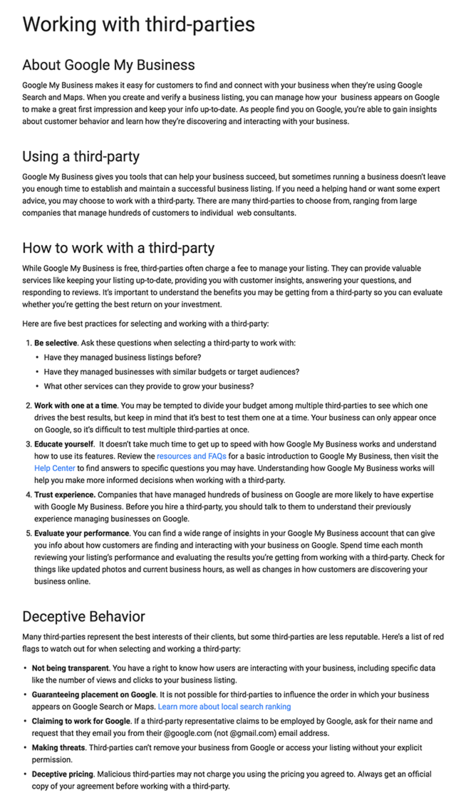 The Google My Business help section added a new page for working with third parties - it aims at giving business owners guidelines when selecting a local SEO company or consultant. While Google My Business is free, third-parties often charge a fee to manage your listing. They can provide valuable services like keeping your listing up-to-date, providing you with customer insights, answering your questions, and responding to reviews. It’s important to understand the benefits you may be getting from a third-party so you can evaluate whether you’re getting the best return on your investment.